When the final definitive history of famous English surnames is written, the surname of Howard will surely be near the head of the list. It appears no less than seventy-five times in the British National Biography, whilst thirty-seven coats of arms have been granted to the name holders. The highest heraldic rank in England is that of Earl Marshall, responsible for all events in which the monarch takes a ceremonial role. This title is held by the Duke of Norfolk, whose family descend from Sir William Howard who died in 1308. Lord Howard of Effingham was the victor over the Spanish Armada in 1588, not Sir Francis Drake as is popularly recorded. There are two possible originations for the surname. It may derive from the Norman-French personal names Huard and Heward, introduced into England after the Conquest of 1066. These were originally adapted forms of the pre 7th century Germanic personal name "Hughard", composed of the elements "hug", meaning heart or spirit, and "hard", hardy and brave. Alternatively it may derive from the Anglo-Scandinavian personal name "Haward", composed of the elements "ha", meaning high and "varthr", a guardian. The names Huardus, Huart and Houardus, all appear as land owners in the famous Domesday Book of 1086, which predated most surnames by at least two hundred years. 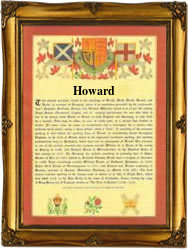 In the modern idiom the surname has several spellings including Howard, Howerd, Heward and Huard. The first recorded spelling of the family name is probably that of Robert Howarde. This was dated 1221, in the rolls of Ely Abbey, Cambridgeshire, during the reign of King Henry 111rd, 1216 - 1272. Throughout the centuries, surnames in every country have continued to "develop," often leading to astonishing variants of the original spelling.